I’ve been on a healthy homemade juice kick since we returned from Mexico in January. I’ve always loved carrot juice and whenever we vacation at the beaches in Mexico, I always order carrot juice with my breakfast if it’s available. Drinking carrot juice before getting sun, as well as after, can also help you hold onto a tan for a bit longer. (But don’t forget to wear sunscreen to protect your skin from harmful UV rays.) Carrot juice is high in Vitamin A and beta-carotene, which aids in tissue and bone development, benefits eyesight, boosts your immune system to help stave off colds, and helps heal dry, flaky skin. Carrot juice is rich in other minerals too, thanks to carrots being a root vegetable, and folates, which are a safe, natural provider of folic acid (and why you’re likely to see pregnant women drinking it). It’s packed with antioxidants, Vitamin C, B complex and also has a low glycemic load, making it a healthy and safe drink for diabetics. What’s not to love about carrot juice? I love to drink it plain, but my husband only likes carrot juice if it has plenty of lime to make it tangy, and some chile to make it spicy. 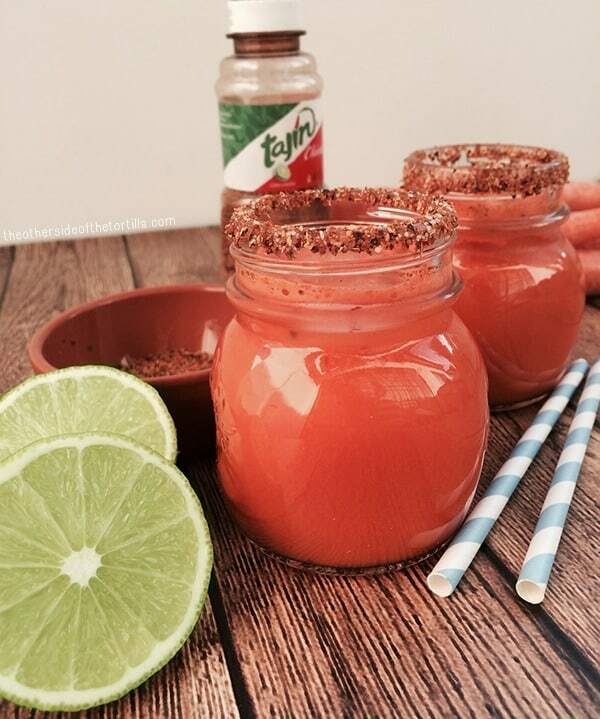 This Mexican-style carrot juice gets a kick from Tajín (chile-lime salt) added to the juice, and you can also rim the glass with chile-lime salt for a fancy look, just for fun. If you don’t have a juicer, you can also use store-bought 100 percent carrot juice (no added sugar) as a substitute for making your own at home. TIP: If you find yourself drinking lots of carrot juice, you can typically buy organic carrots in bulk—usually sold in a 10-pound bag—from Costco or similar stores. 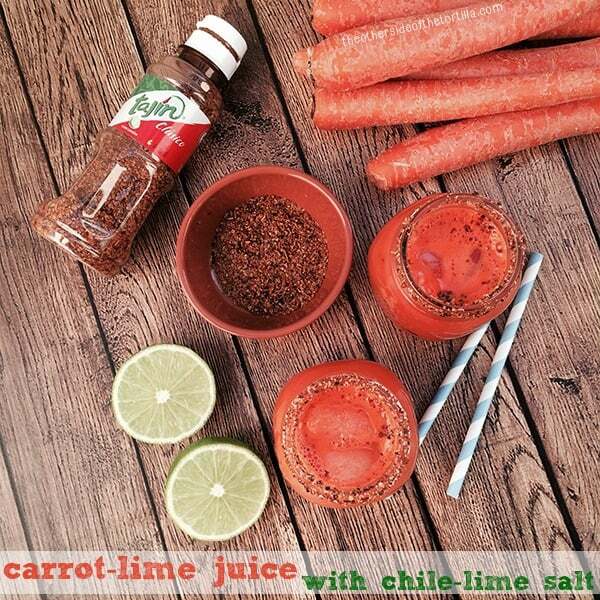 A healthy carrot juice with lime gets a spicy kick from chile-lime salt for a supremely easy veggie cocktail. In a juicer: Using a paring knife, cut the skin off the limes (but not the pith). Start by cutting the ends of the lime off, then you can easily cut the skin starting at one end, down to the other. Save the skins to use zest later, or discard. Put two pounds of carrots plus the two limes through your juicer. Add desired amount of Tajín and stir. Serve immediately, over ice if desired. With store-bought carrot juice (which needs to be refrigerated): Squeeze the juice of two limes into two cups of carrot juice, add desired amount of Tajín and stir. Serve immediately, over ice if desired. This juice will keep in an airtight container (I recommend a glass jar, such as a Mason jar) in the refrigerator for a few days if you don't drink it all immediately. I LOVE carrot juice and adding a kick of spice sounds fantastic! Found your recipe from Tajín’s Instagram photo.